It's been a while but it's about time we had an unboxing review on Tale of Painters. We're going to try something different with this one. SpaceShrimp joins me today and we're going to have a chat to review this new game from Games Workshop after the jump. Disclaimer: Both of us bought our copies of this game with our own money. Our opinions are our own. Garfy: Hey mate, today is a good day. I got my preorder on day of release. 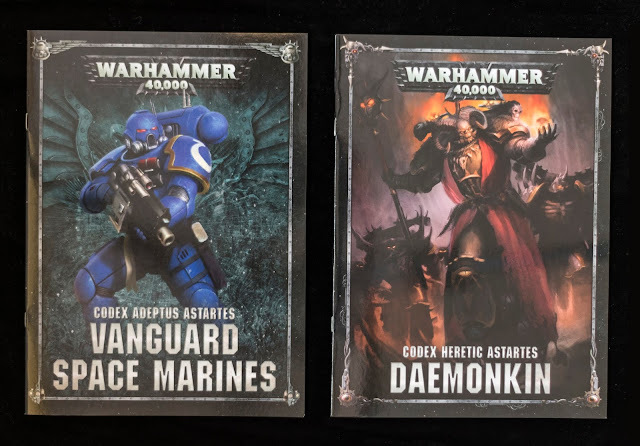 I ordered from the Games Workshop site and got free data cards for all the units in the box with my order. Win! Garfy: Popping the lid off and getting a whiff of that new box smell takes me back to the excitement of teenage birthdays and getting big box games as presents and this is no different. Honestly I'm like a big kid seeing the stack of sprues in front of me. SpaceShrimp: Honestly feel exactly the same. There is just so much to process, can you imagine if we got a box set of this variety and quality when we where kids? I think my tiny mind would have melted, its more or less dribbling out of my ears as it is now. Garfy: Putting the sprues to one side shows the divider sheet. 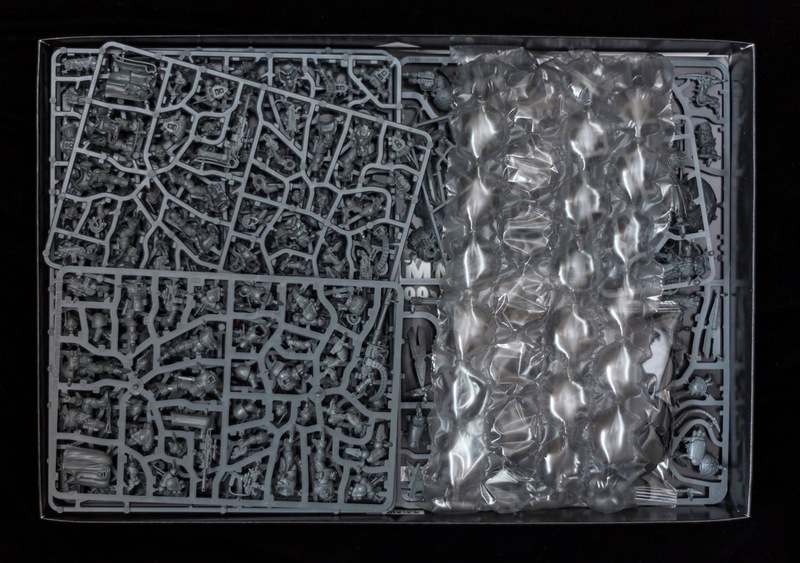 I thought this was a nice way to stop the books underneath getting dented by the sprues (something Conquest could do with implementing). SpaceShrimp: My divider came out of the box almost perfectly, just a few nicks and dents – going straight up on the wall. Bonus! It really is an appreciated feature. I am sure being able to keep books and sprues in pristine condition resonates with most collectors. Garfy: The reverse of the divider sheet is a full colour poster of the box art. Such an awesome touch. Little things like this are cool. SpaceShrimp: How did that Black Legion Marine get so deep into the ranks of the Ultramarines? He is practically standing back to back with the Ultramarine in the foreground. Clearly some weird Alpha Legion shenanigans going on. Garfy: He just wanted some front cover action, such a glory hunter. 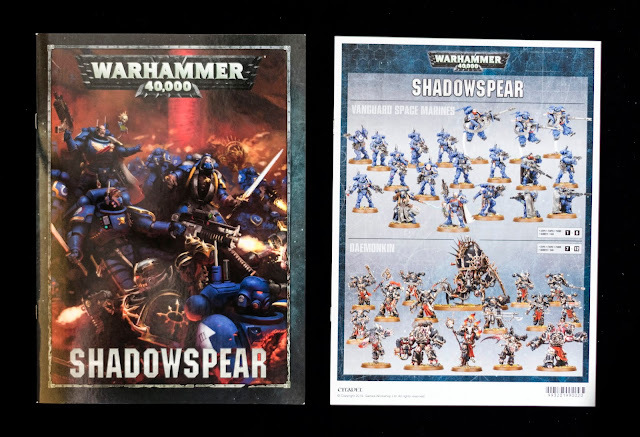 The Shadowspear book is 24 pages of background and missions. Mainly missions. It's a nice inclusion but I feel it could have been longer especially as the background is only six pages. The instruction booklet is detailed and clear, full colour throughout and includes basic paint recipes on the back page. SpaceShrimp: I like the fact that there is a little campaign tree in here. Could have been a bit more comprehensive, but its better than nothing and gives an additional incentive to play the enclosed missions. 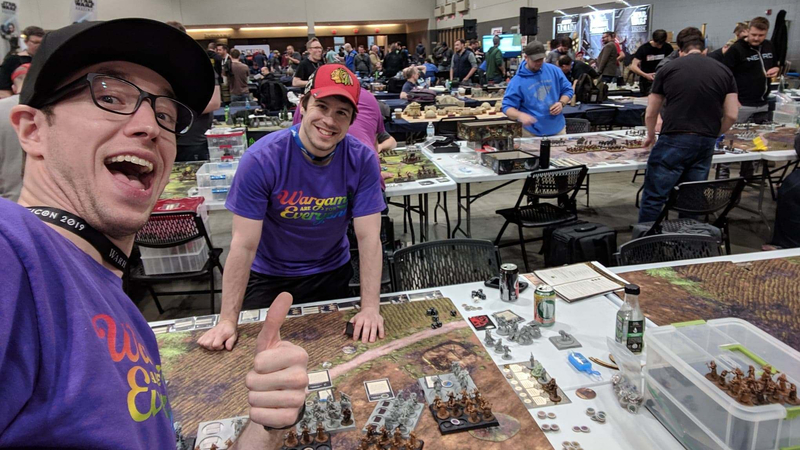 You up for playing through this campaign when we have all our minis painted Garf? Garfy: I'm totally up for playing through the missions. Dark Angels vs Word Bearers it is! 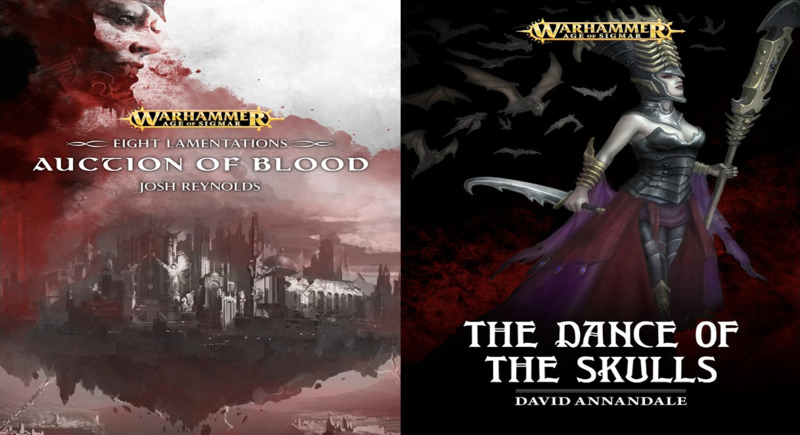 SpaceShrimp: Look at the cover artwork of the Daemonkin minidex…mmm. I am getting some serious demagogue-y vibes of the new Master of Possession. Think some sweet conversion opportunities are on the horizon. Garfy: These Codex Books were sold as complete Codices included in the box and technically they are. They have the complete rules needed to use the models in the book from data sheets to points values to Psychic Powers but at 24 pages long it is only 6 pages of background. I think your right mate, these are minidexes which is cool but they're so striped back and basic. I wish they were a little bigger and I would have loved them to have been hardback. SpaceShrimp: As for content, they both seem to cover all the basic need-to-know stuff which is nice, just wish they were a little meatier in content. In all honesty, however, I do buy boxsets like this first and foremost for the quality and variety of the miniatures, everything else is a bonus to me so I really can’t complain. Garfy: But we have to chat about the models now. This game isn't a new version of the rules. It's more like two armies in a box with rules. 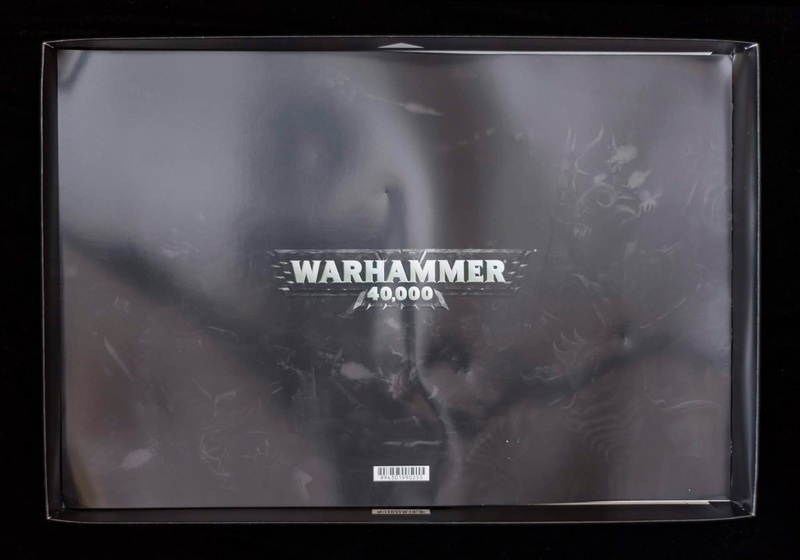 Games Workshop has done this before like the recent Wake the Dead boxed game but all those previous games had existing models in the box with maybe just new HQs models. 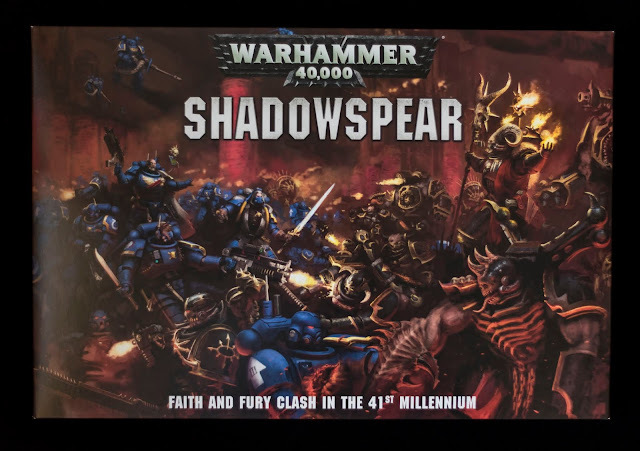 What is exciting about ShadowSpear is it's ALL brand new! Garfy: I must ask you S, what's your favourite and least favourite unit from the box? 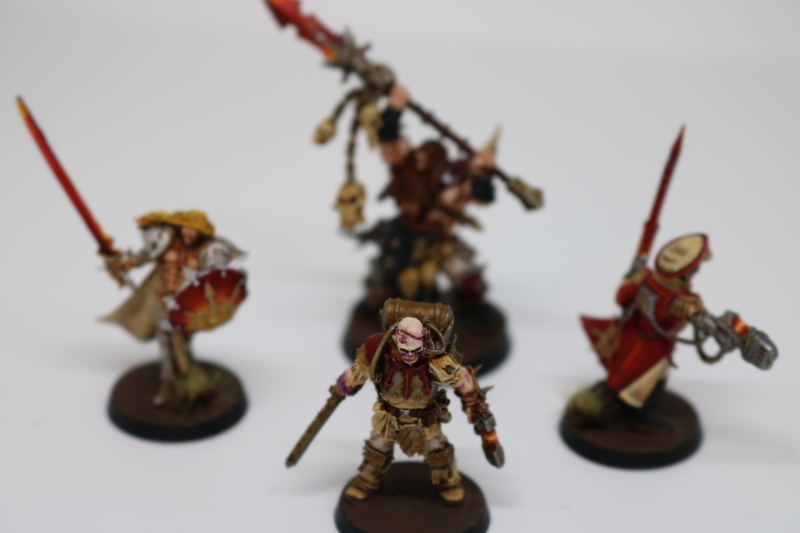 Garfy: Ah cool, I think my favourites will change everytime I paint a new unit but I think my favourite at the moment is the Librarian in Phobos Armour. I can't wait to paint him as a Dark Angel with traditional brown/bone robes. I must say my least favourite is the Suppressor Squad. Flying around with those massive accelerator autocannons just looks a bit clumsy to me. Garfy: What do you think about the value of the box? For me I paid full price and was quite comfortable with that. I have read a lot of comments on social media from people unhappy with the £105 price tag. I can kind of see where they are coming from. 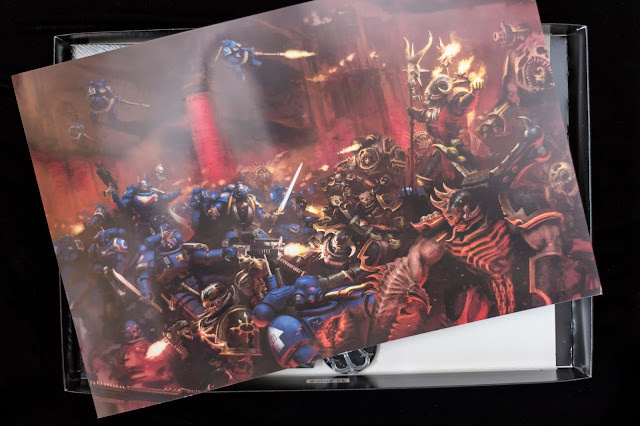 Dark Imperium also had brand new models but also included a large hard backed rulebook (which on it's own costs £45). 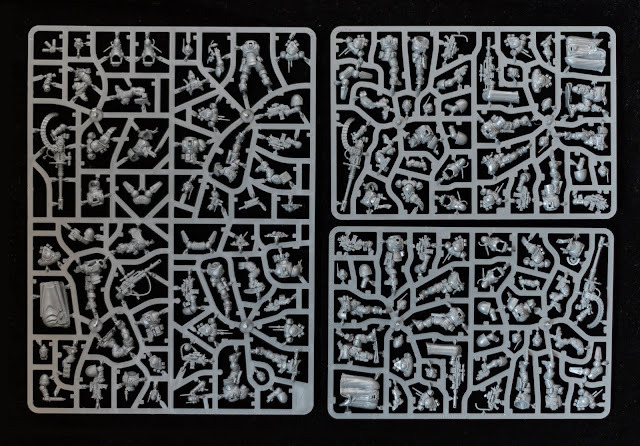 But you only have to look at the three sprues in the picture above. Space Marine characters sell for £22.50, just those three models are £67.50. SpaceShrimp: Price is always going to be a completely subjective talking point. I think for the amount of miniatures it is a perfectly decent price. Do I want it to be cheaper in general? - of course I do, but I am not going to throw my plastic toys out of the pram just yet. Garfy: All that's left in the box is a rules sheet, bases and flying stands. Final thoughts mate? SpaceShrimp: I like big b…ases and I cannot lie. But seriously, did not expect the Venomcrawler to be so big! I thought it was going to be more on par with the bloat drones, so this is a nice surprise. 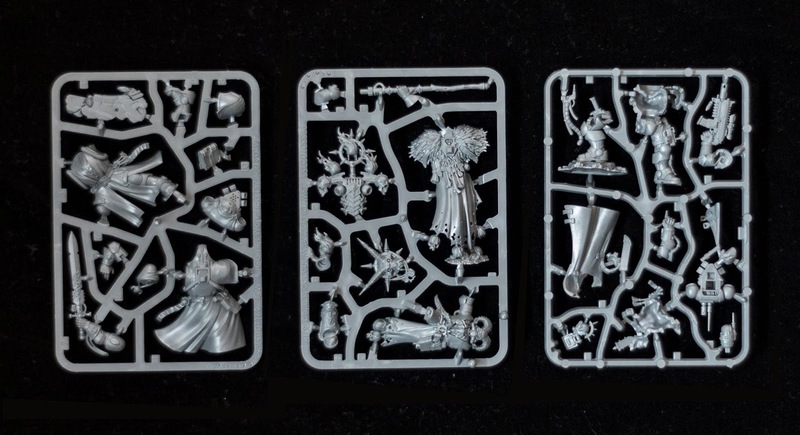 If you want a shed ton of new amazing sculpts, or to bolster either existing forces then this is for you. It is clearly geared as an expansion, so for new collectors I think Dark Imperium is still the optimal entry to 40k. In general, I really rate this set for established gamers/hobbyists. You all know I am a diehard Black Stone Fortress fan, and so many amazing releases have come out since then, yet this has been the only thing to prize away my money and attention which speaks volumes. Garfy: I think this set is great. Getting brand new models, two mini dexes for two armies I already collect is just brilliant. I'm so happy with it. 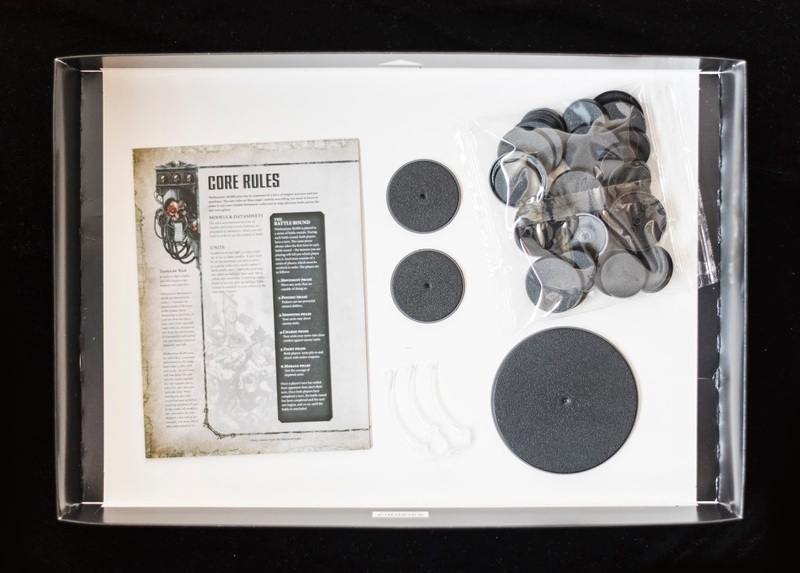 I'm not worried about the lack of dice, big rule book or rulers. This isn't a complete game in that regard, it's more like two start collecting forces with free mini Codices my biggest problem is I'm not sure how I'm going to paint all of it with my Conquest project going on in the background. Do you like our tutorials and reviews? 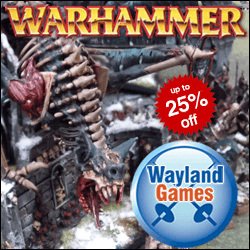 Here is what you can do to support us: Place your next orders at Wayland Games by clicking here or at Element Games by clicking here and save 20% on Shadowspear. Thank you very much, we appreciate any help to keep us going. Thanks for the peek inside this set. Can I ask: are the Chaos Marines still of the traditional scale, or have they crept taller since the up-scaling of humanoid figures to match the new Necromunda figures (& to a degree in light of the introduction of the 'extra-super-duper' Primaris Space Marines)? The Black Legion model is from Blackstone Fortress and should have the same size as these. As you can see, they upscaled them a bit to be on the same eye level as Rubric Marines and Death Guard, but they are slightly below Primaris Marines. Awesome review guys. I'm in the boat of it's a bit too much money at the moment. Going to hold out for the rules updates, come up with some lists then maybe give it a look again. 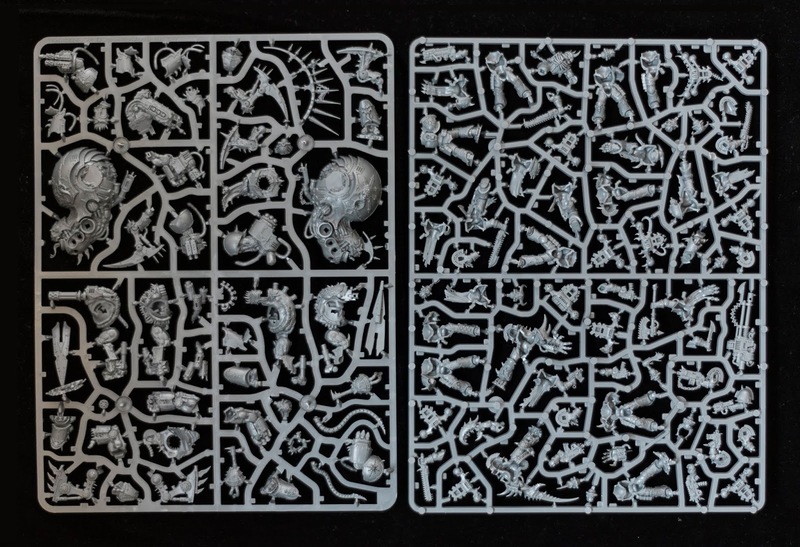 But tough knowing we'll get a multi-part kit of CSM up for preorder this week.